The Vice President of India, M. Venkaiah Naidu today asked banks to maintain strict vigilance during pre- and post-sanction procedures of loans and instructed them never to make compromises in the due diligence processes. 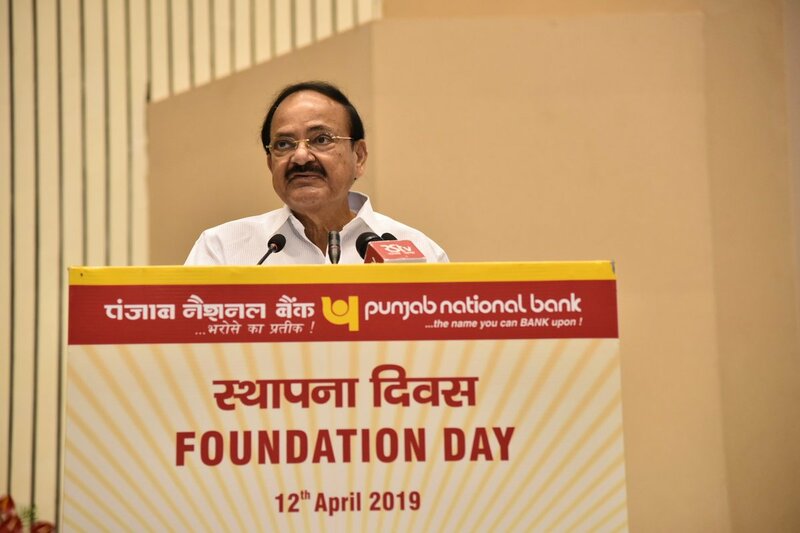 ‘Banks must constantly strengthen their internal processes to effectively monitor funds and maintain strict discipline in lending’, said VP while addressing the gathering at the celebration of the 125th Foundation Day of the Punjab National Bank (PNB), here today. Expressing concern over the increasing cases of wilful defaults and frauds that have recently been in the news, Mr Naidu said that no efforts in bringing these individuals and entities to speedy and exemplary justice. He opined that India must enter into more treaties for the exchange of information and intelligence on financial fraud and bank accounts and work with international agencies in bringing defaulters to justice. He questioned the need for existence of tax havens and said that India must enter into many more strong extradition treaties. Mr. Naidu also called for systemic reforms in the Indian banking sector in light of mounting Non-Performing Assets (NPAs). He spoke of the need to have an effective and efficient system of checks and balances in place so that the loop holes in the system are not taken advantage of. Saying that banks played a central role in India’s quest for financial inclusion and inclusive growth, he expressed firm belief that India’s banking sector was poised for robust growth as the rapidly growing business and commerce in India would turn to banks for credit and other financial services. He cited a number of factors such as the upwardly mobile middle class and the digital revolution as the thrust factors behind these growth prospects. Vice President said that India’s financial institutions have been commended globally for being resilient and for having withstood global downturns and recessions well. He opined that banks were no longer just about strong lockers and a good interest rate on deposits. ‘They have transcended their conventional mandates and are now at the forefront of India’s development story’, he added. He called for ‘Antyodaya’ and stated that development held no meaning until its benefits reached the most deprived groups of people. The Vice President pointed out a number of challenges being faced by the banking industry such as the rising Non Performing Assets in the banking system that has the capacity to affect banks’ lending capabilities. He said that the accumulation of bad loans happened over a long period of time, and now, it threatens to hamper economic growth by weakening the credit supply channel of the economy. Ethical considerations should form an important part of risk-taking activities. The welfare of customers and other stakeholders in good times and bad should be a major concern in any business proposition’, the Vice President said quoting Mahatma Gandhi who said that “Commerce without morality” was one of the seven deadly sins. The Vice President also paid rich tributes to Lala Lajpat Rai, one of the most prominent and inspirational leaders of India’s struggle for independence and felicitated the members of his family. The Chairman, Punjab National Bank, Sunil Mehta, the MD and CEO, Punjab National Bank, Ashok Pal Singh, the Member (Planning and HRD), Postal Services Board and other dignitaries were present at the occasion.